It is an old picture from my purple monster zoom and the Tamron 1.4x Pz-AF TC. Everyone including myself try to avoid TC as much as possible with zoom. Knowing what I know, I don't think I can re-shoot this picture again as I will be afraid of the unknown. The past lucky pictures sometimes remind me to be rebellious to the common thoughts and trends. Though all the disadvantages with image degradation and light loss, I have been using tele-converters on birds and moon shot. And I have made many mistakes in hand-holding the shots with a TC. I will have to try it again on mono-pod and other means in bracing my shots. TC has been essential to me in reaching out to far objects. I have much more bad pictures than good pictures but I use the blog post to remind myself to keep trying to find the right setup and settings while reminding myself that with practices and patience, the chores in using a TC will become less of a problem and that I can enjoy the hard work in pursuing birds and animals. Using an M42 TC on an M42 lens is much harder in focusing due to the closing of aperture blades and the loss of light with a TC mounted. I rely on focusing at wide open aperture and then stop down in aperture change before shutter release. And the whole process can move the focal point easily. My Kenko 2.x TC is not too bad but when it is mounted on my F* 300mm f/4.5, it becomes ridiculously slow in AF, I find it more usable to use it with manual focus. With AF TC, camera SR focal length is always not factored into SR calculation and SR focal length is grayed out in the menu option for changes. 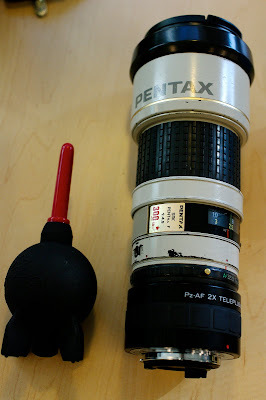 Here the Pentax AFA 1.7x TC shines in that the camera will prompt for registration of SR focal length at start up and one can input the correct SR focal length for proper setup. Those are amazing pictures, thanks for showing!